As many have discovered in recent years, virtualization is a key strategy for infrastructure optimization and a requirement for converged infrastructure. By separating physical devices from the computing, storage, and networking services they deliver, organizations are able to make much more efficient use of these resources. As a result, IT organizations are looking to invest in virtualization-optimized solutions that enable consolidation, mission-critical resiliency, disaster recovery, and faster application deployment. 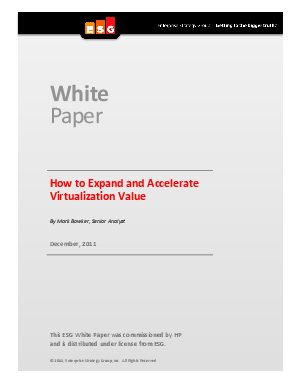 When built-in properly, virtualization can help organizations achieve these goals. But today, while organizations have seen significant impact from server virtualization, many have realized that they need take a second look at the processes and infrastructure to support virtualization in order to gain even more value from it.